Exchange Bureau FULL user gives you all the benefits of running your own Bureau de Change with full features available. BUY and SELL currency to and from your customers with our easy to use online system. FULL BUREAU USERS benefit greatly by having the ability to BUY and SELL currency with ALL the profit being kept by YOU, the member. 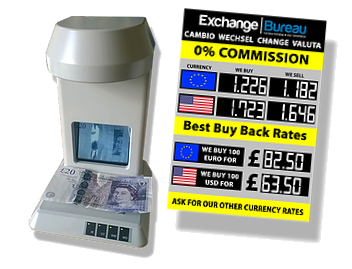 * On average earnings are based on £3000 weekly WE BUY and WE SELL total, with £1500 being SOLD to customers (10% profit margin) and £1500 sold to Exchange Bureau (4% profit margin AVERAGE) This calculation DOES NOT take into account earning made from buying and selling stocks of currency from Exchange Bureau. 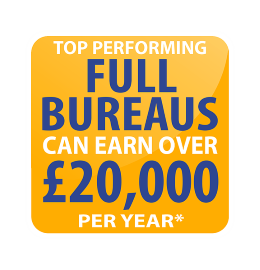 ** Top performing bureau earnings are based on £6000 weekly WE BUY and WE SELL total, with £3000 being SOLD to customers (10% profit margin) and £3000 sold to Exchange Bureau (4% profit margin AVERAGE) This calculation DOES NOT take into account earning made from buying and selling stocks of currency from Exchange Bureau. BUY stocks of currency at discounted rates as and when you require. SUPPLIES section, to order any advertising or stationary products you need. TRANSACTION HISTORY is our unique customisable transaction monitoring tool, where you select your monitoring filters, with FULL customer search functionality. ADVERTISING needs are totally covered with a range of poster, stickers and banners available.